The birthday invitation was made by Oh My Gluestick. I loved how they turned out! Obviously the address is hidden because the last thing I need is some nutso stalking us. 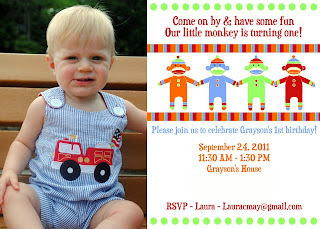 Grayson's 1st birthday party was on Saturday! I felt like a crazy person all week trying to get everything ready & I am happy to say that I think the party was a success! While party planning is not my favorite thing, it was fun to see all the ideas in my head come to life. Since we did G's monthly pictures with Sammy the GIANT sock monkey, I felt like it only seemed natural to have a sock monkey party! Sammy is pretty much a legit member of our family. I used all of his fun colors as my inspiration. I made a yarn wreath for the front door that was inspired by many different yarn wreaths on Pinterest. 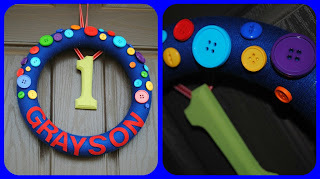 Yarn wreaths take f o r e v e r....but they turn out so cute! I bought felt letters and hot glued them on. Super easy! I also bought the buttons at Michael's, glued a push pin on the back of them, and stuck them on. The "1" is also just push pinned on so that I can change out the number every year. I love how it turned out! I made a birthday banner using different scrapbook papers & cardboard letters I bought at Hobby Lobby. I love all of the fun scrapbook papers I was able to find that matched our Sammy Sock Monkey theme! I hung them up with the Command hooks...whoever invented those was a genius! This is the cute red table in my foyer. We bought the cookies from a local bakery. I took a picture of some monogrammed cookies I found on Pinterest and they copied them for me. They turned out perfect! Melissa emailed me the sign that she had used at her Grayson's party & I just modge podged it to that wooden stand I painted. It's a shame we had some cookies left over...nom nom. I am SO glad that we took monthly pictures of Grayson. It is so fun to see how much he changed! This banner I made was probably my favorite part & I hated taking it down last night! I used all of the sock monkeys we already had for decorations. It's a good thing we have quite the collection! I had to include the Ole Miss sock monkey since they were playing Georgia during the party. They lost:( typical. The monkey in the middle -ha!-is actually to put on a wine bottle. It always hangs out in my kitchen. It cracks me up! ..sock monkey bread muffins, chips & salsa, and spinach artichoke dip. I loved the little highchair banner! I just cut out scrapbook paper and hot glued it to some leftover red ribbon. I used goop (yep, real name) to get the ribbon to stay on the highchair. Cupcakes made by my friend Mary. Delicious as always! I got the sock monkey designs from a seller on eBay for $3.00 and then glued them to scrapbook paper & a lollipop stick to make the cupcake toppers. 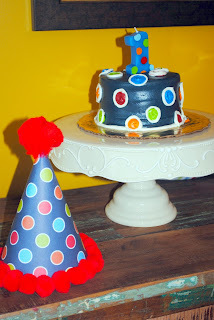 Smash cake made by Publix to match the birthday hat. That hat was so easy to make and I love how it turned out! I will probably do this for all of his little kid parties! The play area for the kids...the ball pit was a hit! I will leave you today with a glimpse at the man of the hour. The birthday boy! He looked extra handsome in his seersucker shorts & birthday shirt made by SheSheMade. I love how everything turned out & I really was sad to take all the decorations down! Now on to the 2nd birthday party...I kid, I kid. It turned out perfect! You did good momma! The wreath is super adorable!! Love everything about this!! If I ever have a boy I'm totally going sock monkey crazy!! Sooo cute!! AWWW everything looks SO CUTE! I love that wreath! I want one now! We all know you're not kidding about starting 2nd birthday preparations! HA! Just kidding. Love everything! The party turned out super cute. And look at that big boy in his custom shirt. LOVE. You did such a fabulous job planning the party! Everything looks amazing!! What a crafty mama! Will you plan and decorate for Landon's 2nd birthday next September? ;) You did great!